PORT OF SPAIN, Trinidad » The hotel manager's notice was slipped under my door: "We are pleased to inform you that outdoor shower facilities will be provided on Carnival Monday morning. We encourage you to use them as you will be held responsible for any damage to linen, furniture or walls caused by oil, tar, paint or mud." Tourist office: Trinidad and Tobago Tourism Development Co., Maritime Centre No. 29, 10th Ave., Barataria, Trinidad. Call (868) 675-7034, e-mail tourism-info@tdc.co.tt. Web: visitTNT.com. » Courtyard by Marriott. Call (868) 627-5555, e-mail courtyardbymarriott@tstt.net.tt. Web: www.marriott.com. I suspected then that the next few days were going to be different from the usual casual Caribbean experience. 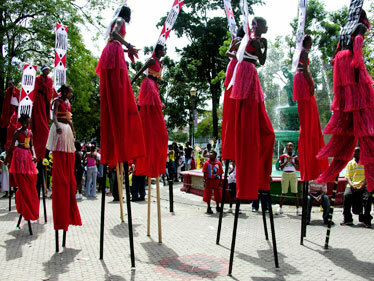 Unlike some other pre-Lenten festivals in the world, the Carnival here in the capital city welcomes the participation of all comers in several events. This includes the opening madness called J'ouvert. It begins at about 4 a.m. on Monday, and if you don't "play with a band" (parade with a club) wearing old messy clothes, someone will make sure that you that you are pelted with as much gooey stuff as they can find before you return to your hotel by around dawn. It's all in good fun, of course, but I have to admit that at my advanced age, I skipped that part of the adventure, limiting myself to hearing firsthand reports from more athletic and happily soiled friends. 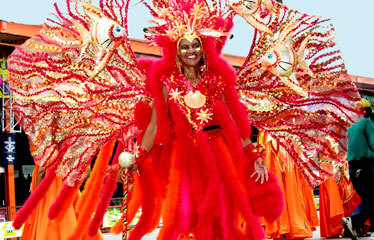 The spirit of Carnival constantly pervades on this small (50-by-37-mile) island. Those who know it best say that there are only two seasons in Trinidad -- "Carnival" (February) and "Getting Ready for Carnival" (the other 11 months of the year). The "mas bands" (costume clubs) spend much of their waking hours over that time planning their elaborate outfits, new music and general merrymaking. To a visitor it seems as if the entire population takes part. There are certain well-defined events that will take place this month. Although my own experience was in 2006, here are the dates keyed to the lineup for Carnival 2007. Although that muddy Monday is the official opening, three important events come days earlier, on Feb. 17 and 18). During the day on Saturday is the Kiddies' Carnival, a costume parade of youngsters through the downtown city streets, accompanied by their proud parents. 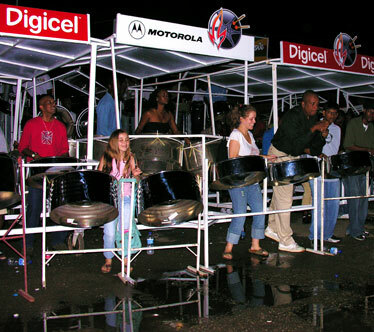 Then, on Saturday night is Panorama, the final steel-pan musical contest in the grandstand on the Savannah, the great open parkland in the center of the capital city. Generally speaking, the music is composed not of the gentle calypso songs I remembered from my youth. When I first thought about attending the Trinidad Carnival, I imagined some melodious steel band favorites of long ago -- ditties like "Rum and Coca Cola," "Mama Look a Boo Boo" and other Harry Belafonte tunes. That kind of thing is all but extinct now in favor of an outgrowth of Calypso called soca -- a hard-thumping, rhythm-happy music. The "Coins of Carthage" costume on this dancer, center, never stopped bobbing as he crossed the stage at the Trinidad Carnival. 'Cause we deserve to max it up, max it up, max it up!" This steel-pan rehearsal session invited one of the younger musicians to sit in. 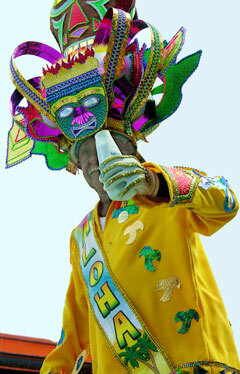 FEB. 18 will see the Kings and Queens Costume Competition. 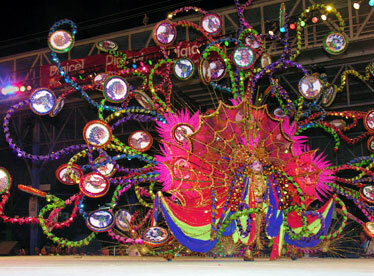 Some might consider the large, colorful creations that float and flutter across the stage as something more than a costume. They can weigh as much as 200 pounds, extend as high as 30 feet in the air. Some contestants are aided by articulated outriggerlike wheels so they can move across the stage. Many are inspired by such creatures as fire-breathing dragons and outsize butterflies, and sometimes feature special effects such as laser beams, fog or even falling "snow." After the aforementioned mud and oil madness on Monday morning, thousands of citizens and even some tourists who are going to "play mas" might get a few hours' sleep before donning glittery, often revealing, costumes to begin the mas (masquerade) parade throughout the streets of the capital. The dancing is pretty much instinctive. If you can jump forward, backward, sideways and turn around now and then, you're qualified to play mas. Some of the movements are described as "chipping" -- a sort of bent-knees shuffle forward, which is all the dancers can do anyway when the crowds are too heavy. 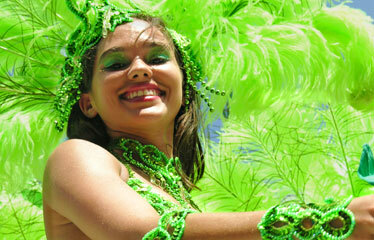 Carnival begins in earnest on Feb. 20 this year. All day, thousands of costumed dancers begin jumpin' and chippin' along a 3-mile route until they finally cross the stage in their bands, saving their most dramatic moves for the judges in the reviewing stand. It's a process that takes all day and runs into the night. Then at midnight, everything stops cold -- no more music, no more dancing. Lent has begun. For some it will be their first good night's sleep in several days. One of the strangest entries in the Trinidad Carnival parade supposedly had a Hawaiian theme -- but neither the music nor the costume reflected anything that would have been recognized in the Aloha State.